Thera joined the Outdoors for All team in October 2013. She is a native of the Seattle area and grew up enjoying outdoor activities from the water to the mountains and exploring much of the state on horseback. After earning her B.A. in Communications from the University of Washington, she began working in resource development and marketing at local non-profit agencies. She especially connected with Outdoors for All for their work with children. Since starting her time with Outdoors for All, Thera has enjoyed learning about adaptive recreation and has been inspired by the dedication, generosity and enthusiasm shown by volunteers and participants. 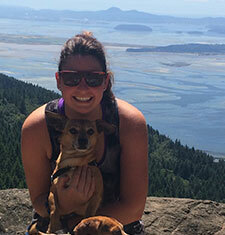 Thera lives in Edmonds with her husband Adam, son Lane, and their dog Joe. Together they enjoy traveling, snowboarding, cooking, gardening, and rooting for the Seahawks and Huskies. Copyright © 2014 Outdoors for All Foundation. All Rights reserved.